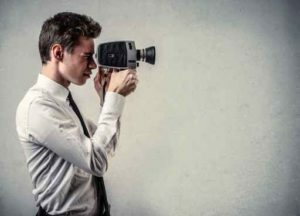 We all know that we need to be doing more video in marketing our business. But how are we supposed to make that happen when we’re busy doing so many other things to run the business? I was meeting with one of my clients the other day about this very topic, and knew it was information I needed to share. Like all things, it helps if you have a streamlined plan that makes sense. Don’t think that you need to go hire a video production crew, or spend budget on professional video editing. While there are great uses for both of these, there’s a lot to be said for the authenticity that comes from just pointing a camera at yourself and saying “shoot”. Plus, DIY videos allow you to have consistency in posting your videos out to the world and your followers, which professionally produced and edited videos will not simply because of the time and money required. With that said, let’s jump into my simple 6-step plan for developing a whole lot of video content by using a simple video marketing strategy. I’m going to walk you through a fairly simple plan to develop anywhere from 3 months to 1 year of video clips you can use to share on your social media, depending upon how frequently you plan to post. You want to think of general categories for topics you can use in your video messages. There are a couple of simple ways you can segment this. For example, the client I was meeting with the other day is a real estate agent, so an easy way to divvy up some categories was buyers, sellers, investors, renters. A car dealership may have buckets like new, used, and service. Or perhaps they segment theirs based upon the different manufacturers they carry: Ford, Lincoln, Mercury. (I think one of those is closed now, but you get my meaning). A hair stylist may segment their category buckets like cut, style, color. Or men, women, kids. Take a piece of paper and write down your 3 or 4 buckets, because we will be using those in the next step. Use our handy video bucket planner found here. Ideally you want FOUR, so if you only have three, add this one: re-purposed content. An easy way to think of things to discuss in your marketing video is by taking content that you’ve already used, which is likely in text form (or an image with text), and turn that into a video. This can be an easy way to expand your video marketing strategy. Under each category or topic you chose, you want to write four things. This could be the top four questions your customers always ask you about the topic. Or it could be four pieces from a FAQ that you’ve already developed. Or the four best TIPS or TRICKS that you always share with your customers. Or your four favorite accessories that relate to your topic. Tools of the trade. Products you recommend. Write these four items under your topic bucket. These will become your four videos for this topic. Because you have four buckets, and each now has four questions or topics, you have just generated 16 ideas for videos you can create. You want to keep your videos SHORT and to the point – that gets the best response from your viewers. You’re going to be aiming for one to two minutes on each video, so as you can see you won’t have a lot of time to be too elaborate. Under each topic you listed in Step 2, write 2 to 3 bullet points that you want to make about that topic. Perhaps you are a hair stylist, and one of your topics is your favorite styling gel to use. You would make 2 to 3 points about that product. Maybe it’s made of all natural ingredients, has really great hold, but still lets you comb through your hair. Right there are your three points. The reason you need these is that you want some type of general guideline of what you’re going to talk about on the video to keep you focused and on track. However, you do NOT want to “over-rehearse” and try to memorize exactly what you plan to say. For one thing, this never works. You forget one word halfway through your spiel, and it throws you completely off the rest. When you’re so over-memorized, even one little slip can ruin the entire video shoot. This is why you want to simply choose your bullet points, and then naturally speak about each of those in one or two sentences while you are recording your video. Believe me … I have a lot of experience in this … it’s the easier way to go (unless you have the ability to do a lot of editing). I’m not talking about whether to get glazed or chocolate. And we’re also not fully talking about a donut in the real sense of the video world. Usually in advertising, a donut is where a company has standard video footage that contains the exact same beginning and ending, with the middle left open (like a donut hole) to drop new original content in each time. It’s meant to maintain some consistency and make it a bit easier for the company to push out new content quicker. For our use, you’re going to want to think about having a pretty standard opening and an outro closing that contains a Call to Action. You want to plan this video introduction out in your head before you start shooting your video, so that you can maintain that consistency in your presentations. For our purposes, we aren’t trying to make oscar-worthy productions that require something new and fancy each time; we’re going for a consistent message to brand your business, and for that, having consistency among all of the videos is key. This is the only portion of the video that you may want to rehearse a few times to make sure you feel smooth and confident. Even practicing recording this on video and watching it to see if it feels smooth can be a good idea. So you will begin every video with the same introduction (it does not have to be EXACT, if you change up one or two words now and then don’t think you need to record again!). This introduction needs to be brief, to the point, and high energy. Check out some video introduction tips here. You will end each video with a similar Call to Action. The exact action you ask viewers to take may vary slight from video to video, but you always need to include the ask! Think about how you will be using the video to determine which type of call to action you want to include. Most of my clients would be posting the video on their Youtube channel, and sharing that on their Facebook business page and maybe sending it out in an email. So think through those platforms. Both allow you to like or give a thumbs up to the video. If you plan to include a link to your website in the description, you will have that available for viewers to click. You want to direct viewers to do one (or two) by simply saying “subscribe to my channel or give this video a like” … or maybe “for more great tips, visit my website by clicking the link in the description”. Think through how you want to introduce yourself, and what you may ask your viewers to do at the end of the video. Again, don’t worry if these vary slightly from video to video; what you’re wanting is a similar overall “feel”. Your videos don’t all have to be done as a Facebook Live video. Put an appointment with yourself on your calendar. Why do we never do this enough? We are important enough for an appointment too! You want to give yourself at least an hour, and in that hour you’re going to knock out one bucket (four videos). Set up your video camera (we have tips in another post which I will link at the bottom). Film all four topics in your one bucket back to back. You want to shoot each video as a separate video, so start and stop the camera for each one. You will be left with four video files. You may even find that you can shoot the next bucket at the same time, and knock out eight in one sitting. I know some people who will plan the majority of a day and knock out all of their planned videos for the year in one sitting. It just depends upon you. Don’t worry about changing your appearance between each video. You’re not going to be wearing something very flashy anyway since that detracts from your message (see related posts below for full information on that). Don’t worry about watching each video right after you shoot it, and shooting several retakes, before you go on to the next. Unless you completely mess up when shooting one topic – such as completely forgetting what bullet points you were going to talk about and staring at the camera with a dazed expression – you don’t need to bother re-shooting. Stumbling over one word won’t break the video. A firetruck with sirens blaring going down the street right outside your window while you are filming may require a re-shoot. Don’t overthink it. Don’t worry about that one stray hair. Or that the lighting wasn’t perfect. Or that your makeup wasn’t good enough. Or you stuttered over one word. As long as none of that is to the point of distracting the viewer (the stray hair is waving with the force of a hurricane), just go with with you have. As you continue to film more videos in the future, you will gain a better understanding of how to best present yourself and be able to continue tweaking and improving your final result. But until then, you’re still being authentic, and people relate to our authenticity and our flaws. This is a powerful engagement strategy that most people don’t even realize; you should use it! And remember, not even the pros are perfect – that’s why there are outtakes (and it takes a year to film a movie lol). Telling people to be looking for a future video can be a very effective part of your video marketing strategy. But don’t do this step until it’s all ready to go. Get all of your videos (at least all four for one bucket) uploaded to Youtube or wherever you’re going to host them. After they’re all uploaded, don’t quite post them on your social media YET! (See extra resources at the bottom for ways you can optimize your video on Youtube). You want to TEASE your audience now, and start posting things like “Starting February 1, I will be hosting a special real estate buyer video series! You won’t want to miss it!” … or whatever works for you. Tease this about two weeks out (more if your schedule allows and your audience would relate), and repeat the tease several times. Be sure to include the tease on all of the social media platforms on which you plan to share the videos. You may want to pre-schedule a few teases so that it is repeated without you having to remember to do it every day. Next, pre-schedule your social media posts to share the videos spread out on your pre-determined schedule. Since you have four topics, you can easily push out one video per week and do a full month. If you choose a different schedule, you could post one every two weeks, or one per month. But go ahead and get the social media postings of each video pre-scheduled on your page, so that when you get busy (which you will), the video still goes out at the promised time. Be sure in the text description of your post, you pre-tease the next video … “Catch us next Monday for the next video in this series”. Four buckets posted weekly will get you 4 months of videos using the above method (a weekly schedule will likely get you the most traction). Four buckets posted bi-weekly gets you 8 months of videos. Three buckets posted monthly gets you one full year. This entry was posted in How To, Video and tagged video marketing strategy. Bookmark the permalink. ← How can I afford a great website for my business? Never heard “donut” used in this way, but I like it! We built something very similar in to our own production process from the very start. We give the client a choice between 3 different intro/outro animations, which saves us from having to dwell on the minutia, and allows us to jump right in to the story-telling. We do custom CTAs and music, but even so, I can’t even imagine how much time we’ve saved by building the donut concept into our process.